Job is not a book that I would choose to read often, but for whatever reason, it keeps popping up. And, since God is bringing it to my attention, I decided I need to perhaps pay a little closer attention to it. Oh boy, do I have the questions… and not a lot of answers. 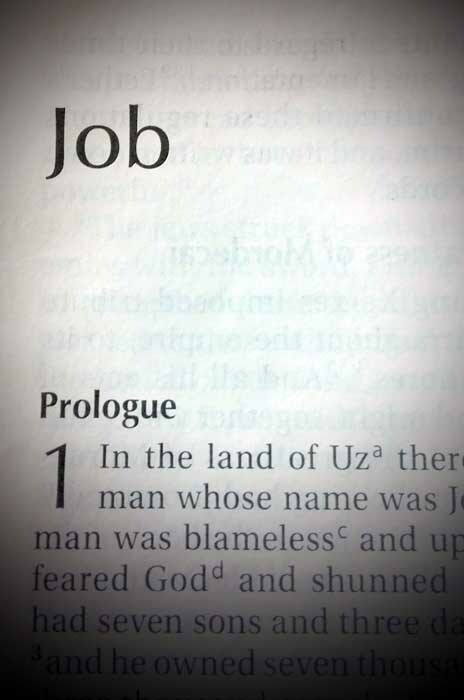 Did Satan know Job’s worst fears? If he did, is that why Job lost his children, his wealth and his health. And, how would I respond if God allowed the devil to bring against me the things that I fear most? We know the devil prowls around like a roaring lion looking for someone to devour (1 Peter 5:8), therefore none of us is beyond his attack. He knows our weaknesses, and he knows where to hit us hardest to try to destroy our testimony of God’s power in our lives. We also know that while God protects us, he doesn’t protect us from everything we fear. He protects our souls and he will present us before his glorious throne without fault and with great joy (Jude 24). He will bring us through our trials, but will we be like Job, never cursing God, or will it be as escaping from the flames, so close to burning up that we will smell like smoke and ashes? (1 Corinthians 3:15). But will I? How can I be assured I will stand firm? I don’t know. But I do know that fear is not the way to live. What is fear? I decided that fear is when I “Forget Everything About Redemption”. So the antidote to fear must be to remember everything I can about redemption. I have been redeemed – I have been purchased by God, not with silver or gold, but with the precious blood of Christ Jesus. I have been bought out of an empty way of life (1 Peter 1:19). I belong to God. As God’s possession, it is completely up to God what he wants to allow in my life, and how he wants to use me. It is up to God how to sanctify me. It is up to God how to discipline me. It is up to God what suffering to allow. It is up to God what tests to bring. It is all up to God. Will there be suffering? Yes. And we shouldn’t consider it strange to suffer (1 Peter 4:12), everyone who is a Christian will suffer for Christ’s sake. But our suffering is nothing compared with the glory to come. Remembering the power of my redemption and the One who redeemed me calms my fear. It keeps me from letting fear paralyze me. It keeps my fear in perspective. It keeps me from falling to fear. It keeps me from dwelling on the what-ifs. I pray against the things I fear, as probably many of you do, and I have to trust God that should he allow those things, he is sufficient to sustain me in the heartache and suffering that would come with them. I think that if the Lord should allow the things that I fear to come upon me that I would not put on a Pollyanna face and pretend that all was OK, but I do hope that I would be strong in him, and remember that what I fear the most cannot destroy me. What I fear the most cannot overcome my faith in God and what I fear the most cannot defeat God. God will always be God, and I trust that his grace will always be sufficient for me, especially in my weakness 2 Corinthians 12:9. I trust that God’s grace will be sufficient for you. Are you living in fear? Is it time to remember the wonderful life to which you have been redeemed? You were not redeemed to live in fear, but to live in the power of the resurrection Philippians 3:10. Will you choose to live fearlessly? And when we live fearlessly, does that remove weapons from Satan’s arsenal? I know there is nothing I can do that will make God love me more than he does now. Also I know, there is nothing I can do that makes God love me less than he does today. Thanks Marcia. Ultimately, I must remember my redemption. And love this truth… What I fear the most cannot overcome my faith in God and what I fear the most cannot defeat God.